I found myself ranking desserts in my head. Here are my preferences in order: One, would be cake, with frosting. Cannot be carrot or spiced. Cookies and brownies and bars are tied for second. Probably because they can be cake like in texture. Coming in just behind in third place are homemade candies like buckeye balls (without rice krispies-I’m a purist), coconut balls and fudge. In fourth place is pie with key lime and cherry topping that list. Lastly is cheesecake. I rarely eat cheesecake. Just not something I go crazy over. Then there is a gray area that I don’t know where to place. This includes ice cream, tiramisu, and creme brûlée. Love them all, just not sure how much. Now there is a little condiment known as lemon curd that I adore. To me this is a dessert all on its own and it’s a winner. It is tart and sweet, not really creamy, but……simply delicious. You could tie my hands behind my back and I’d stick my face in a bowl of lemon curd and lick it clean it’s that good. It is wonderful atop scones or cupcakes. You could dollop it on waffles, fill cakes with it, or just eat it plain. That was my inspiration for this dessert. Since raspberry’s have been especially wonderful, I added them for color, texture and to contrast the tartness of the lemon curd. It worked beautifully. I used Ameretto Liquor because that’s what I had at home, but it adds an unexpected almond surprise. The layers compliment one another so that each bite leaves you wanting more! I highly recommend making this the night before you serve it. It tasted even better the next day! In a microwave safe bowl, combine sugar and eggs. Whisk until well blended. Stir in lemon juice, lemon zest and melted butter. Stir until smooth and combined. Cook in microwave in 1 minute intervals. Stirring well after each minute. You’ll know the lemon curd is done when it coats the back of a metal spoon. For me, this took 4 minutes. Cover and chill in the refrigerator. 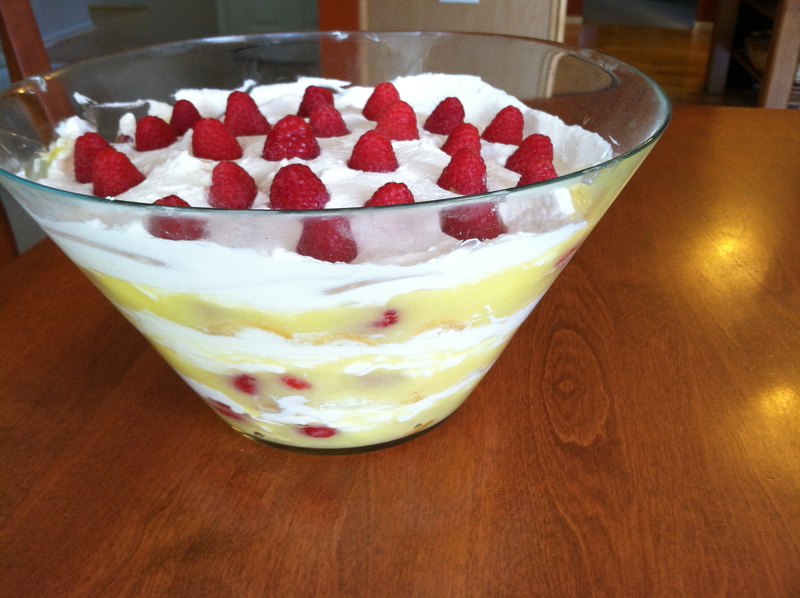 In a chilled bowl, beat the whipping cream and two tbls of the sugar until soft peaks form. In another bowl, beat the remaining sugar, the mascarpone and the extracts until smooth. Fold in 1/3 of the whipping cream into the mascarpone until incorporated. Fold in remaining cream. Dip lady fingers quickly into the Amoretto and layer in a 9×13 baking dish. You may have to cut or overlap lady fingers to fit. Spread half of the lemon curd over your lady fingers, sprinkle 1 cup of raspberry over lemon curd. Layer a half of your cheese mixture over the raspberry’s. Repeat layers starting with lady fingers and ending with cream layer. Garnish with more raspberry’s if you like. Cover and chill at least 4 hours, but preferably overnight.